I think it's really easy for us to approach God in prayer with a "God the Magic Genie" mentality. We come to the Lord with a major problem in which we need His help. We've lost our job. We have marital problems. We're suffering from a severe illness. We're deeply in debt. So, we pray for deliverance from our difficulty. 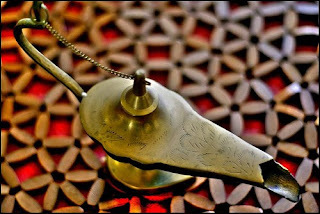 We come before God with a "rub the magic lamp" attitude so to speak, expecting our wish, our desire to be granted. I believe in prayer and have confidence that God answers prayer. Unfortunately, His ultimate answer doesn't always line up with our desires. From my own personal experience, I've been praying for a miracle in my own family and nothing appears to be happening but impending disaster. For 10 months, I've prayed for God through the Holy Spirit to move in someone's heart and mind, and there is no change. There is no movement toward repair. And so the questions come: God, why isn't this person willing to change? Why isn't this person convicted of sin and your perfect will? Am I the problem? Am I the solution? Do you have a different, better plan that I can't see, yet? Are you allowing this difficulty to shape me into a stronger follower of Christ? Why do I feel stuck in limbo right now? What can I do that I'm not doing? Right now, I have no answers, only questions, but what do you do while you wait on the Lord? Pray with an attitude of "Your will be done in this situation." Ask the Lord for wisdom. Desire the mind of Christ in your decision-making process. Focus on spiritual growth in your own life. Talk to friends in whom you can trust their advice. Focus on what you can do, not on what you can't do. Be patient. Be still and know that He is God. Always do right things, even if others aren't. Are you currently locked in prayer with the Lord, seeking an answer from Him on a major problem in your life? How are you handling the situation while you wait for an answer? Yes I am there! I am seeking God to move in a mighty way and change a heart breaking situation for "the good of those who love Him." But right now, nothing has changed! I know that part of this is Satan trying to get me to turn my back on God, like he tried with Job. But I also know that Christ loves me endlessly and He sent his Comforter for me. So while I wait I dedicate my spare minutes to prayer, and I spend as much time in the scripture as possible. I have also determined to by at my church whenever the doors are open. I know that no matter what happens I want to grow closer to God, and I am ready for Him when that time comes. Shirley - I hear ya! Hang in there. What ever happened to commitment?